Having your own chef and cleaning staff mean that you spend your holiday relaxing and enjoying rather than working – this is self catering with style! Your own private speedboat and dhow complete with skipper means you are uniquely positioned to enjoy the region’s many marine attractions, the nearby reefs of Mnemba island being probably the prime attraction! Lovely pool area and spacious shaded veranda area – this villa has been carefully and cleverly designed for maximizing your outdoor holiday fun! 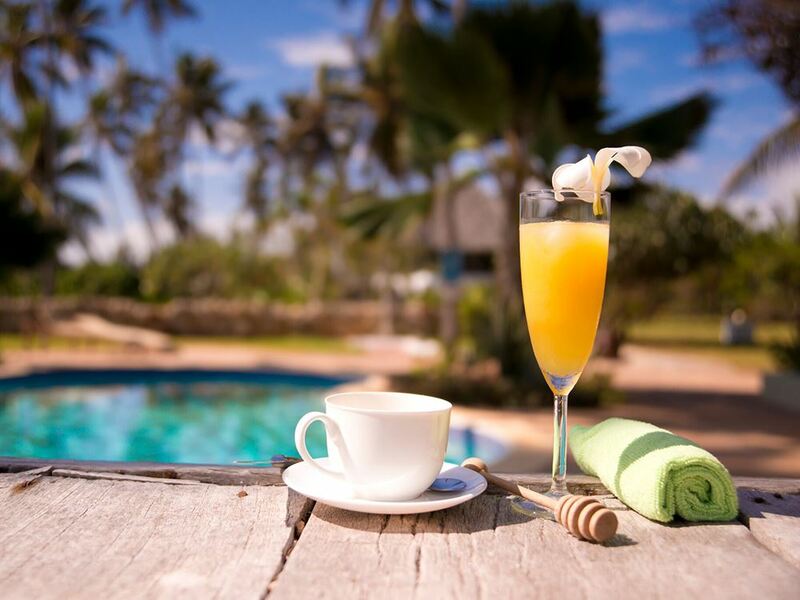 Finding a nice villa available to rent on Zanzibar is pretty rare – finding one that’s luxuriously appointed and boasts such features as its own swimming pool, air-conditioning and even a private speedboat and dhow for your personal use and you’re into the rarer than hen’s teeth category! 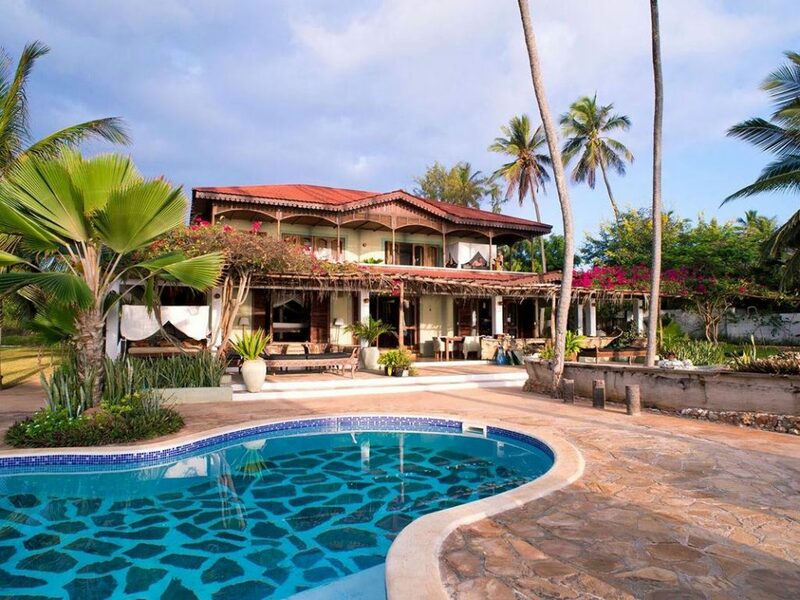 Well we’ve managed to find an absolute gem that ticks all these boxes – a 4 bedroomed luxury villa situated on a gorgeous stretch of beach on the island’s north-east coast that goes by the name of Villa Loiki. So what do you get? Well, there are 4 lovely and very spacious air-conditioned bedrooms – 2 of them upstairs with separate en-suite facilities boasting excellent quality fittings; and 2 on the ground floor which share a bathroom, these being ideal perhaps for parents with young children. Whilst naturally sleeping 8 people, a couple more guests can be accommodated on comfortable air mattresses. Also inside is a state of the art kitchen equipped with the latest Siemens fridge/freezer as well as such mod-cons as ice- making and bread baking machines. Of course being on holiday you’re unlikely to want to spend too much time in the kitchen, so you’ll no doubt be delighted that the villa also comes complete with its own highly capable chef and 2 ladies who’ll cheerfully clean everything up on a daily basis! The high tech theme continues in the comfortable lounge area which comes complete with music system and satellite TV (frankly not our personal idea of island relaxation but no doubt very popular amongst any teens in your group!) The style of the villa is not the traditional Swahili style that we have to admit to preferring, like the Villas at Jambiani for example. So rather than a makuti thatched roof there are red tiles for example, whilst the interior décor is given over to a quirky African feel with plenty of faux animal skins and the like. But the real focus of the villa is the gorgeous shaded front veranda area which itself is just a couple of steps away from an inviting pool – we’ve no doubt that the majority of your holiday will be spent relaxing in this very inviting space accompanied by a good book and some long and very cold drinks! Another fantastic feature of the villa is the huge, wonderfully kept garden. In fact the huge plot of more than 1 hectare is home to just Villa Loiki and one other villa – the result being a fantastic feeling of space not matched by many places on the island! Of course, there’s plenty to do away from the villa itself – the beach in front is a superb stretch of the softest white sand and perfect for swimming at high tide or going on long strolls. But the real clincher is that Villa Loiki comes with its own speedboat as well as a dhow and a captain, a really friendly guy called Nondo who’s skilled at taking you to the best snorkeling spots on the famous Mnemba reefs that lie just 10 or so minutes boat ride from the villa. The use of the speedboat and dhow are shared on alternate days between the Villa Loiki and the neighbouring villa - on one day you have use of the speedboat and the next the dhow. Keen fishermen can be whisked beyond the reef in pursuit of trevally, barracuda or kingfish; or you could head instead to a pristine sandbank for a picnic or fish barbeque. Having this freedom is pretty unique on Zanzibar and elevates an already excellent villa holiday into an unforgettable experience!